Scott and I, a few months after we met in 1997. 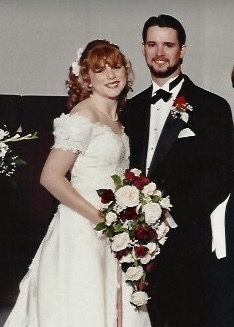 Nineteen years ago today, I put on a pretty white dress, tried my best to ignore all the stupid family drama, and walked down an aisle where this guy was waiting for me. Sometime, if you have a few hours and buy the margaritas, I can tell you all the reasons that day absolutely was NOT the best day of my life. I can tell you all about how, if we had had any sense, the day he said, "What do you think about us getting married?" we should have just gone and done it and told everyone later. In 1997, I moved to Texas to start a teaching job. Sometime in September of that year, one of my co-workers (a sweet, mom-type teacher) invited me to visit her church. Due to limited space and the size of the congregation, this church had what I'd grown up calling "Big church" (the sermon in the sanctuary) first, then Sunday school. Even as big church wrapped up, I was still debating going to Sunday School, but my friend pretty much insisted. The church had a great singles program. I'd love it. She even walked me to the door then went off for her own class. I noticed the cute guy sitting by himself, but facial hair wasn't my thing. He had a mustache and a beard! But he kept catching my attention. Everyone was settling in, saying hello to each other, that kind of thing. There was a bible in the seat next to him. I didn't know if it belonged to his girlfriend or a buddy or if he'd brought two for some reason, but I decided that if someone moved that bible I would go up an introduce myself. Because, well, why not? Right as I made that decision another guy picked up the bible and walked away. I don't remember crossing the room. I just remember standing in front of him and saying, "Hi, I'm Dawn. This is my first time here. Do you mind if I sit with you?" He didn't mind. Not at all. We didn't get much chance to talk. You know, listening about the word of God and stuff, but the best part was during the closing prayer. Instead of focusing on what the leader was saying, all I could focus on was how loud this guy next to me's stomach was growling. I mean, think of a cross between a lion and grizzly that hasn't been feed in months! As soon as the leader said, "Amen." Scott turned to me and start apologizing for his hunger (he told me later he wanted to be sure I understood he was starving, not suffering from some kind of gastrointestinal issue.) "That's okay," I told him. "Your stomach gave my stomach ideas." That's when he broke out his super smooth line. "Then why don't you let me buy you lunch?" I let him buy me lunch then ice cream after the evening service then dinner the next weekend then...We were married just over a year later in that same church. Thanks for the invitation, Anita. Happy Anniversary, honey. Love you bunches. You can read about how he won my heart with a hammer here and the great (wow, we really need a sarcasm font) prank he and my dad played when he asked my dad to if he could marry me here.